Hello all! I'm ditching the opportunities today to talk about my November experience. I know I've been a complete ghost around the blogosphere, but I'm back. To be honest, something had to give. For those of you who don't know, I participated in National Novel Writing Month (NanoWriMo). In order to keep up and make my word count, I had to give up a few things. November is a very busy month for me. There's Thanksgiving, my birthday, my mother's birthday, the anniversary of how long I've been in my sorority, Black Friday, the list goes on! Plus, there is a lot of drama at my office so I found myself working more to help out. I didn't think it was possible, but I found myself (yet again) learning from NanoWriMo. Here's what I learned this time. I had the idea that I would write a story about human trafficking. It was the most depressing thing I have ever had to write. I fell behind in my word count because I was avoiding it. To have to look at it everyday, was putting me in sad moods. And then there was the research. I read voraciously and watched videos and movies, which would often result in me crying (and trust me, I'm not a crier.) I've always liked writing darker fiction, but I think a book of this magnitude needs to be written with enough time so that breaks can be taken. Do ALL of it BEFORE November! I guess I didn't really think about how much research was going to have to go into a book like this. I found myself trying to balance my time between researching and writing. It would have probably been easier if I had gathered all my information before, and then I would have been free to just write. It's really just too hard to catch up! On the last Sunday I had to write 7,000 words in one day. The Sunday before that I did over 5,000. While it is possible to do this, it's more stressful, at least for me. It's much easier to have to crank out 1,667 words than 7,000 in a day. TRUST me when I say this. Drag yourself to your computer everyday and get that word count in. This was only my second time doing NanoWriMo and it was a very different experience from last year. It was tougher this time around for me. I thought last year was bad when I fell behind (somewhere around 3,000 words I think) but this year with all the circumstances, I fell behind a little over 13,000 words! It is insane trying to come back after that. I've seen writers write over 100,000 words for the month but that's just not something that's for me. Still, despite my rough patches, I made it through and it makes the victory that much sweeter. I learn something about myself as a writer and writing in general every time I do NanoWriMo. It's safe to say I can't wait for next year! 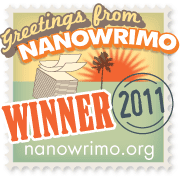 Did you participate in NanoWriMo? Did you have any rough patches? Congrats on winning! I'm super impressed, especially considering the setbacks you had. I never understood why NaNo was in November. Could they pick a more difficult month to get things done?? I've never participated but I might give it a shot next year. I'll definitely keep your advice in mind. I'll research first, and pick a story I want to get up close and personal with everday! But you know what? You still won, so that's the important thing. I'm cringing a little at your novel topic; it's something I would never ever write about. A lot of people I talked to this year had a hard time starting or completing NaNo, which makes me think there was something in the collective water. Congrats on winning! I knew you could do it. And I'm with you and pretty much everyone else. This years NaNo was a lot harder for me. My topic was also depressing- a boy who was kidnapped but got away. I was just sad and also bored while writing it. But we all got through it like Alicia pointed out and we WON! Good job for pushing through all the busy that November threw your way! These are great tips for someone who hasn't done NaNo yet. Like me. I've taken notes. Congrats on winning! I had too much stuff going on this month and didn't get a chance to do NaNo, but that is some really great advice! Thank you for sharing these tips! I've done NaNo four times and I agree with everything you've said here. Many congratulations for overcoming such a huge word count deficit and winning! You deserve more than a winner's certificate!